Whatever you might think about the rise of the fashion retailer Primark, there’s no disputing that it’s one of the big retail success stories right now. 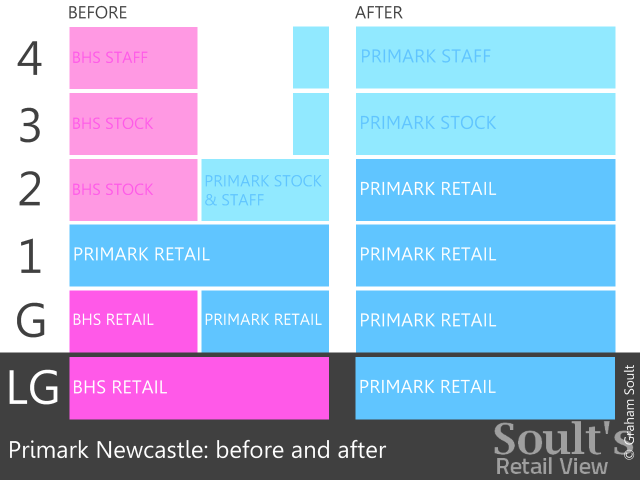 Just here in the North East, Primark opened its new 58,700 sq ft Metrocentre store (which I’m still yet to check out) and revamped Middlesbrough store last autumn, while the chain’s current developments in Sunderland and Newcastle are well advanced on site. 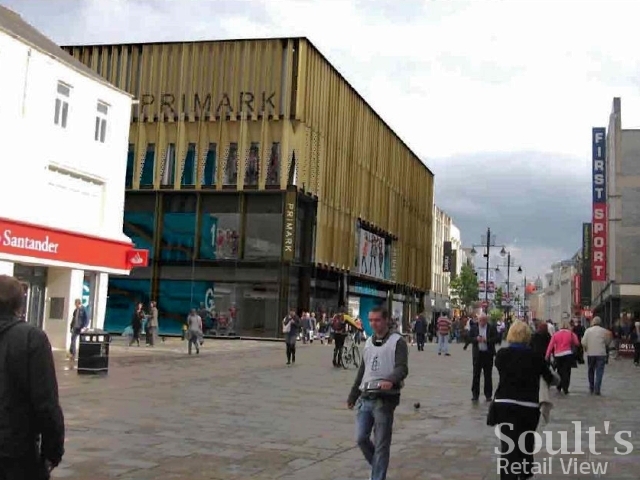 I’ll cover Sunderland’s new Primark in a coming post, but in Newcastle I noticed yesterday that a big corner chunk of the existing building has now been nibbled away (above) as the redevelopment and refacing of the property continues. As you may recall, Primark is expanding its current store into the former BHS next door, while BHS, in turn, is transforming the nearby ex-Next building. Primark, like BHS, is now using the hoardings around the site to announce its ‘refurbished store coming soon’, though no specific opening date is given. Given the scale of the work involved, however, my guess is that it’s unlikely to be before the latter part of this year. 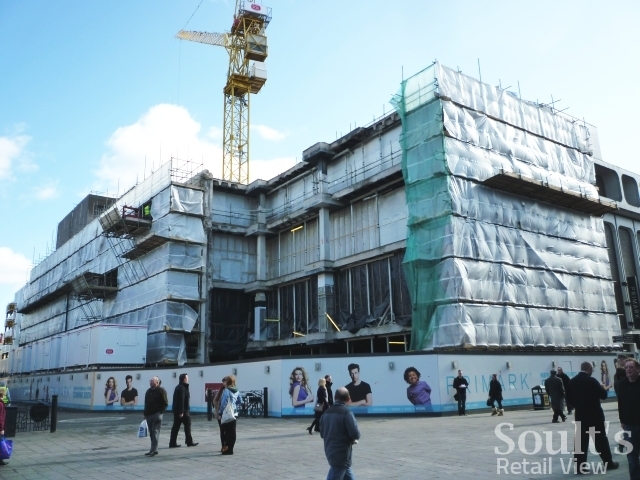 Indeed, it’s worth reminding ourselves of the size and complexity of the project: 114,000 sq ft of retail floorspace over four floors, including the total refurbishment – while still trading, it would seem – of the existing 50,000 sq ft Primark store. 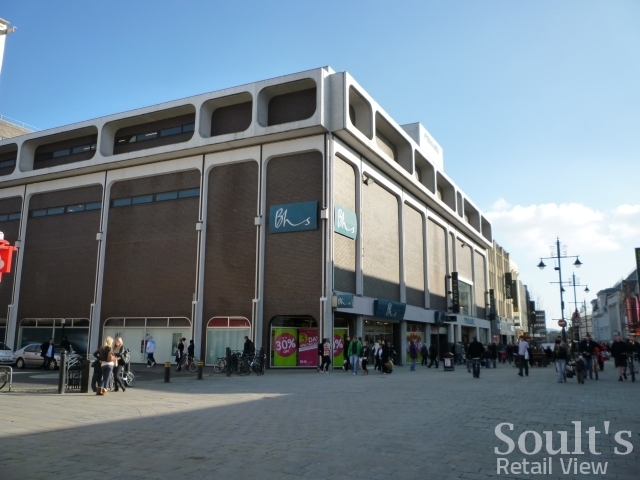 Originally built in the 1970s for BHS and C&A (which Primark replaced in 2000), the property has always had a complicated and slightly curious configuration. 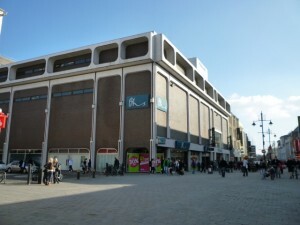 BHS had the lower-ground floor and half the ground floor as retail floorspace, connected via stairs to the staff and stockroom space on the second, third and fourth floors. 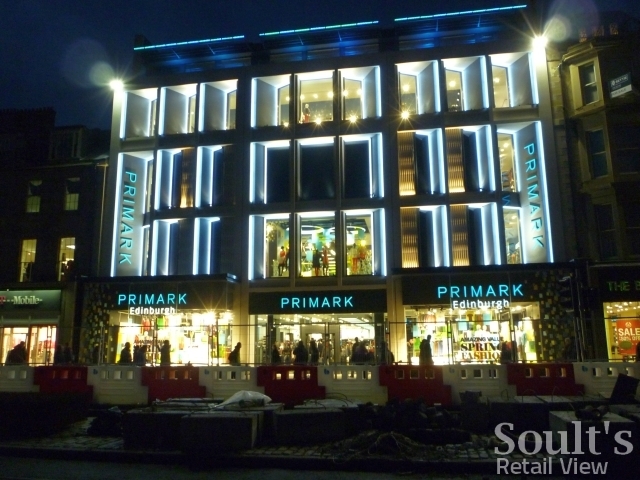 Primark, in turn, currently trades from the rest of the ground floor and all of the first, with its stockroom and staff spaces also on the upper levels. In contrast, the new store will – as shown in my simplified sectional diagram above – provide a much more streamlined and usable layout, with four uniformly-sized retail floors. Notably, the second floor will be brought into retail use for the first time, with the stockroom and staff facilities relocated to the enlarged third and fourth floors that are being built out over the former third-floor roofspace. As the impression (above) by architects 3DReid shows, the removal of the corner section that I mentioned a moment ago will allow the creation of a ‘customer feature stair’ with views out over the street. This staircase will connect all four retail levels, and will complement the bank of new escalators that will be situated in the centre of the new shopfloor. 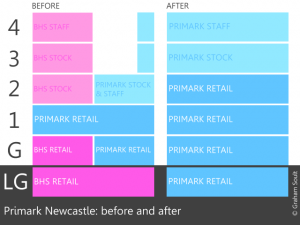 In some respects, Primark’s current development in Newcastle mirrors its recently opened 75,000 sq ft store in Edinburgh, where it has taken a rather unattractive building – once home to Littlewoods – and transformed it into a modern flagship store, again designed by 3DReid. 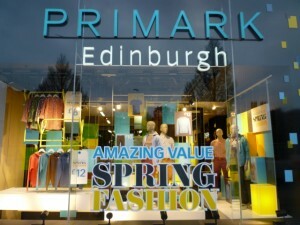 Indeed, when I visited Edinburgh a few weeks ago, I was struck by how Primark was the best-looking building, Jenners aside, on the whole of Princes Street. With Newcastle’s Primark set to have a similar positive impact on the streetscape – as well as boosting the city’s retail status – its opening should be well worth the wait. Love your Blog I have been following it for ages now. 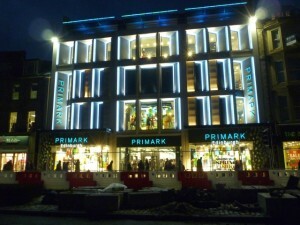 Can you tell me when you expect the new Primark expansion to be completed and also the new BHS shop as well.